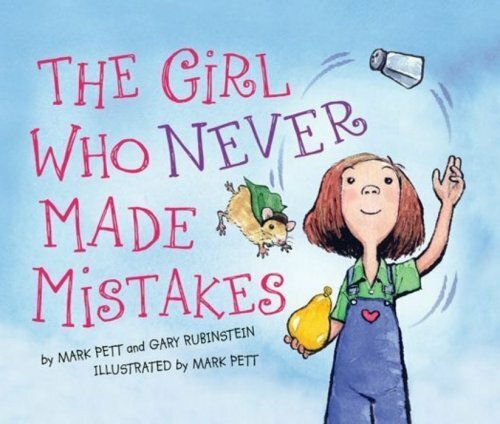 The Girl Who Never Makes Made Mistakes is excellent for teaching children that we all make mistakes. We can have a discussion that it is not about the mistakes we make, but how we learn from them that is important. Also, sometimes when we make mistakes we should see the funny side. After all, being perfect is boring! This book can also be helpful for children who are afraid to try things because they think they won’t be good at it. As well as having a lovely moral, this book can be used to target a range of language goals. There are a couple of metaphors in the book, such as “she felt her stomach jumping inside her” and “the pepper rained down”. The temporal concepts (first, next, finally) are repeated in the book, which outlines the sequence of events. This book is written in the past tense, so it provides many examples of regular and irregular past tense verbs. See the list below for further speech and language targets. To stay updated on the latest and greatest picture books for speech and language development, subscribe to our email newsletter. Hi! I'm Cecile, a Certified Practising Speech Pathologist from Western Australia. I am passionate about using great picture books in therapy sessions. Find out more about me (and see a photo of our recently adopted fur baby). Feel free to send me a message - I'd love to know about your favourite picture books!